Billionaires and local governments pledged nearly €500 million to help restore Notre-Dame cathedral, with foundations and crowd-sourcing sites also launching fund-raising drives. President Emmanuel Macron has vowed the emblematic church will be rebuilt after its spire and roof collapsed last night in a blaze thought to be linked to extensive renovation work. "The fire will go on for several days. I would like to thank the firefighters on behalf of the nation," he said. "Notre-Dame is our history, our imagination, where we've lived all our great moments, and is the epicentre of our lives. "It's the story of our books, our paintings. It's the cathedral for all French people, even if they have never been. But it is burning and I know this sadness will be felt by all of our citizens. "Tomorrow a national subscription will be launched for people around the country to help rebuild this great Notre-Dame," he said. French billionaire Bernard Arnault announced that he and the LVMH luxury conglomerate he controls would give €200 million for the reconstruction efforts. The pledge came after Mr Arnault's rival Kering, the fashion group founded by fellow billionaire Francois Pinault, offered €100 million to help "completely rebuild Notre-Dame". The chief executive of French oil giant Total said the firm would contribute €100m. Other high-profile French donors so far included the investor Marc Ladreit de Lacharriere with €10m, and construction magnates Martin and Olivier Bouygues, also with €10m. Pledges were also pouring in from anonymous donors to groups including the privately run French Heritage Foundation, which said it had already secured pledges totalling €1.6m. On a more modest scale, a fund set up by an "anonymous Parisian" on the Leetchi fundraising platform had topped €20,000 today. And the Hungarian city of Szeged promised to donate €10,000 to the reconstruction effort, in recognition of the help it received from the French capital after a devastating flood in 1879. Paris Mayor Anne Hidalgo today proposed organising an international donor conference to coordinate the pledges to restore the gothic architectural masterpiece. "Since yesterday I've been hearing that it will take a decade, what nonsense!" former culture minister Jack Lang told AFP outside the church. European Council President Donald Tusk has called on the EU's member countries to help France rebuild Notre-Dame, saying the site in Paris is a symbol of what binds Europe together. He said: "At stake here is something more than just material help. The burning of the Notre Dame cathedral has again made us aware that we are bound by something more important and more profound than treaties." 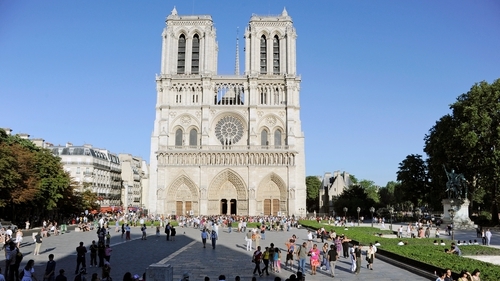 The gothic edifice had been undergoing an €11m overhaul financed by the French state to repair damage inflicted by time, pollution and the weather.